“Have you eaten yet?” is the way the Chinese greet each other, and that is the way Gloria B (Esther Scott) is greeted by Richie Po (Dennis Dun) in the play Po Boy Tango, written by Kenneth Lin and presented by the East West Players at the David Henry Hwang Theater in Little Tokyo. Forget that Richie and Gloria have not seen each other in 10 years. Forget that Gloria used to care for Richie’s daughter Emma, who barely survived cancer. Forget that they left each other on ambiguous and hostile terms. Richie immediately feeds Gloria but in doing so unfortunately reveals his terrible cooking skills. The tables are turned, however, when Gloria grills him a delicious sandwich. Although he has remarkable and sensitive tastes, he lacks the culinary skills of his mother, so he seeks Gloria’s help. Gloria is a retired hospice worker who dreams of opening her own soul-food restaurant, and Richie promises her that if she helps him recreate the “Great Banquet,” he will become her partner in building her dream restaurant. Initial conversation runs along the topic of food, with occasional jibes at “those crazy skinny people.” Amid this casual talk, however, runs a deeper narrative as hidden details are revealed about their personal lives, backgrounds and struggles. At the first taste, the play seems to center around food, but the main dish contains ingredients such as racism, ethnicity, history and friendship. Underneath this tentative partnership lies troubled friendships, complex misunderstandings and past wounds. 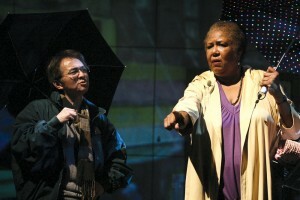 Though they joke, laugh, eat and even tango together, their underlying sentiments eventually erupt, and they express strong, bitter emotions toward the end of the play that heighten the tension already there. For example, it never becomes clear why Richie is so fixated on recreating this banquet, or why Gloria accuses Richie of being racist and no better than the other Caucasians. The plot and underlying themes are confusing and hard to follow, which is frustrating because the play held real potential to present a unique perspective of the Asian-American community. Still, despite the lagging script, low-budget production and simple stage design, the actors’ acting is convincing and entertaining. The characters are endearing, and some of their lines clearly amused and delighted the audience, especially those of Po Mama (played brilliantly and hilariously by Jeanne Sakata). When the short, scrawny Richie and the tall, rotund Gloria hold hands to tango, the sight is both ludicrous and charming. Even though they scrape at an empty bowl of shark fin soup, the way they lick their spoons and smack their lips creates a strong sensory imagery that causes the audience to salivate as well. Po Boy Tango makes a worthy attempt to infuse the universal interest in food with unique racial and ethnic themes, but ends up both overcooking and undercooking a lot of its ingredients. A little bit more time spent tweaking and simplifying some ingredients might make it more palatable and digestible. But right now, it is still one messy recipe — one that leaves its audience unsatisfied but curious and hungry enough to return for a revised dish.